The patient presented to the clinic with back pain and leg pain that was not getting better. He has been experiencing pain for years. Six months ago the pain became intolerable. On a scale of one to ten his pain was on average a 7 (10 being the most severe). The pain was so bad that he could not work. Before he came into the Illinois Back Institute he had tried many different therapies none of which helped, and in his words some made him worse. His goal on entering our treatment was to get rid of the pain in his back and leg and more importantly avoid surgery. He heard about us on television and didn’t think the treatment would work because nothing else had, but he wanted to avoid surgery. On day one he rated his pain a 7 (10 being the most severe) and his Oswestry Disability Index was scored at a 42 (0-100). The index is an indicator of how well the patient can perform activities of daily living. The score is used as a way to measure the effect your pain has on your ability to live your life. The higher the score the more your life is effected by your pain. Patients that score 42 don’t get better on their own and typically end up in surgery. A score of 42 would indicate the patient was severely disabled from the pain. The Oswestry disability index Scores are used as an indicator of disability and are as follows. Because all other interventions had not successfully helped our patient feel any better, and he continued to have a score of 42 indicating a severe disability from the pain, we were his last hope for regaining a normal life. Our patient was experiencing complicated back problems that if did not get better we would be looking at a surgery on his spine. The surgery of choice for this paint would most likely be a fusion of the vertebrae of his spine. This is a very complicated and costly surgery with a lengthy recovery time. 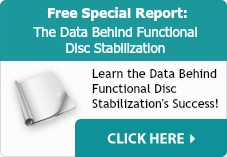 Our evaluation revealed that the patient had issues with his posture that caused and increase in load on his discs. He also had some muscle weakness in his primary stabilizers of his spine and his core. Our goal was to decrease the pain and facilitate healing in the disc and spine and reactive and strengthen his stabilizing muscle and correct his posture. After 12 treatments his pain had dropped to a 4, and his ODI (Oswestry Disability Index) had lowered to a 32. I will talk more in future blog posts about the effect of treatment and ODI; there are some interesting examples of treatment outcomes based on the ODI. The ODI outcomes from fusion surgery may be surprising to most people because they are not very good. After his 24th treatment we saw his pain go down to a 2 and his ODI at a 30. Also, it was at this time that he started to have days where the pain was completely gone in his leg. He was improving at a steady pace as expected. He had very complicated back problems that were evident on his MRI. He had tried 5 other therapies that failed to improve his condition, and he had a very high Oswestry score. This combination we knew would indicate a slower recovery period. Patients that have their problem for years tend to take a little longer but with persistence we see the scores improve and the patients start to feel better and get their life back. He was able to avoid surgery and get his life back. Illinois back institute using functional disc rehabilitation is able to help eliminate some of the worst back problems and disabling pain.